semi-final and Antonine Primary School in the final. The final was played at half time of the Glasgow Rocks BBL match against Leicester Riders. The Scottish Sports Futures event, which is funded by Cashback in the Communities and sponsored in Falkirk by High Station Grocers, Falkirk and Falkirk Fury BC, has been a programme in Falkirk Primary Schools for eight years, rising from 12 schools to 20 plus taking part in the annual event. St.Margarets Primary School in Polmont were the very first winners of the event, but since then, despite the highest standard of opposition being thrown at them, Maddiston have won every year. 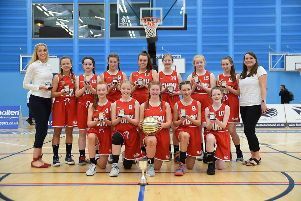 The school has in turn seen many of its players go on to achieve not only Scottish national success with Falkirk Fury BC but also have a number of players become Scotland International players. In Saturday’s under 14 Scottish Cup finals, for example, Fury’s winning boys and girls teams had a number of players from Maddiston Primary School. The final four Competition at the Emirates had seen Maddiston, Comely Park, Antonine and St.Bernadettes go through to contest the Jump2it finals, after a local competition at Grangemouth SC had seen 20 teams compete for the four spots. Congratulations goes to all involved with the Maddiston team, coach Wright and all at the school for not only supporting a great basketball event but having such a consistent and excellent basketball programme which has helped lead to this unprecedented success. The four schools were presented with their medals at the end of the Rocks game and met the winning Rocks team, which meant celebrations all round. Maddiston Primary School are pictured after their Emirates Arena success. Even with the basketball seasons ending, keep an eye out in the Falkirk Herald for more.